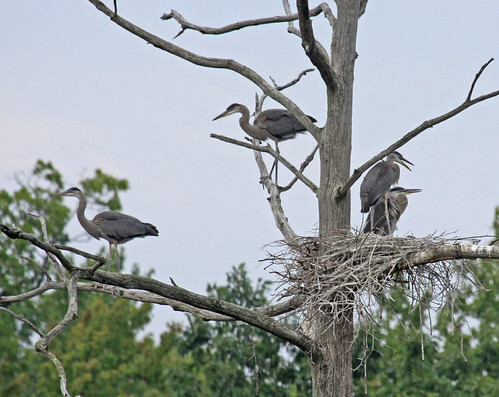 Back in 2009, a pair of Great Blue Herons built a nest on a dead oak in Sapsucker Woods right outside the Cornell Lab of Ornithology, and I spent an inordinate amount of time photographing the growing family. Our best views of the nest from the building couldn’t show what was happening inside the nest, though we were pretty sure the parents were incubating eggs, and then they were spending time away from the nest and standing over the nest, possibly feeding young. Finally, one day we spotted a tiny chick whom I impulsively started calling Mario. We had no idea whether there might be any other chicks hunkered down as one was visible, but within a couple of days, we started seeing two at once—Mario and Luigi, of course. When we started seeing three, they became Mario, Luigi, and Princess, even though we couldn’t tell them apart. Over a week later, suddenly there was a fourth chick, noticeably smaller than the others. I called that one Yoshi. And immediately, scientists at the lab started telling me that there was virtually no chance that little one would survive, because of starvation or siblicide. I should not get too attached. But of course I did. Day after day, week after week, I kept watching and photographing the growing nestlings. Yoshi stayed smaller than the others, and remained in the nest over a week after the others fledged. But after they left the nest, Yoshi got the lion’s share of feedings and soon caught up in size. 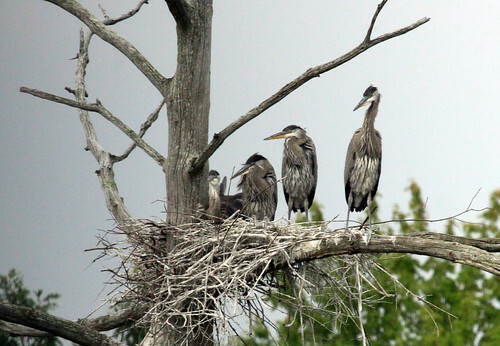 Yep—all four young made it to fledging just fine. 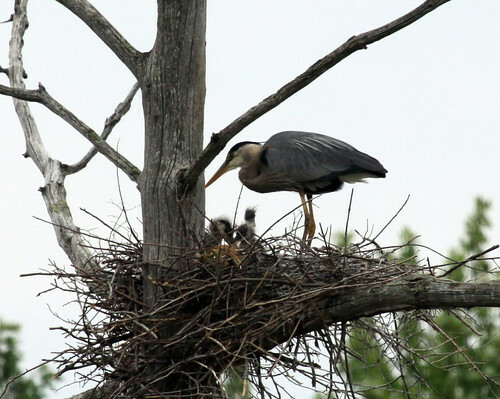 As it turns out, siblicide is a common event for Great Egrets, but not Great Blue Herons. And the pond provided plenty of food to sustain four growing chicks and their parents. 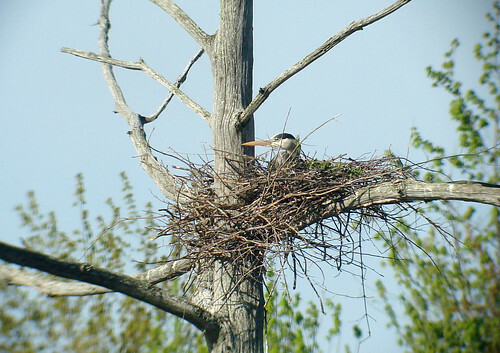 Three years later, when the Lab put a nest cam on that heron nest, the female produced five eggs. Now we had tens of thousands of online viewers, and our extremely close views of parents and eggs, and then chicks, vastly increased how emotionally invested we all became. A snowstorm and then a dented egg put people in panic mode. is where the second chick is pipping. So yes, a dented egg could and did hatch. Some of the cam monitors thought they should prepare people for worst case scenarios, because of course it was unlikely that all five eggs would hatch and produce chicks that survived to fledgling. I tried to keep my approach strictly scientific: let’s see what happens. 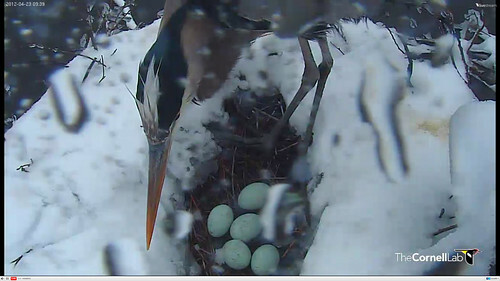 Together, the cam viewers were the first people ever to have 24-7 views this close of any Great Blue Heron nest. 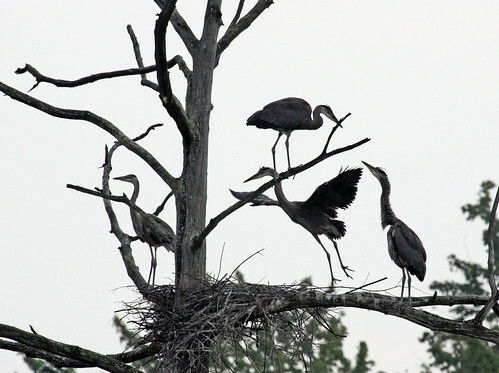 Everything we saw was new and fascinating as we witnessed all five eggs hatching into five healthy babies, the last to hatch, days later, much smaller than its older siblings, but again all five successfully fledged. 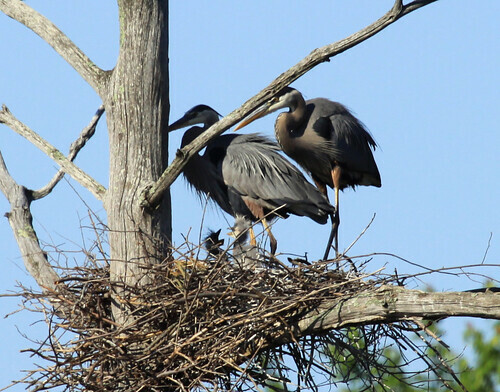 I thought a lot about these herons, and how easy it was to envision worst-case scenarios and to panic, or to at least try to maintain a resigned, unemotional detachment knowing that something bad was looming, after I got my suspicious mammogram results in January. I got through the follow-up mammogram, the biopsy, all kinds of tests, and surgery. I learned that I have the ATM mutation that had quadrupled my chances of getting breast cancer in the first place—that news made me actually feel lucky, though: breast cancer held off until I was 65, and when it did appear, it was nothing more than a Stage 0, with no cancer in the margins or lymph nodes. I’d cancelled all my out-of-town spring speaking gigs before surgery, knowing the probabilities of problems using my left arm for a while. And even Stage 0 breast cancer patients are often treated with radiation and hormone therapy, and so even with the best-case scenario I couldn't be sure how well I’d handle travel and public speaking. As it turned out, after reviewing my particular case and all the statistical probabilities, my oncologists and I decided those follow-up treatments wouldn't be wise. So I'd made the practical preparations for worst-case scenarios that turned out to be unnecessary. At least this time. 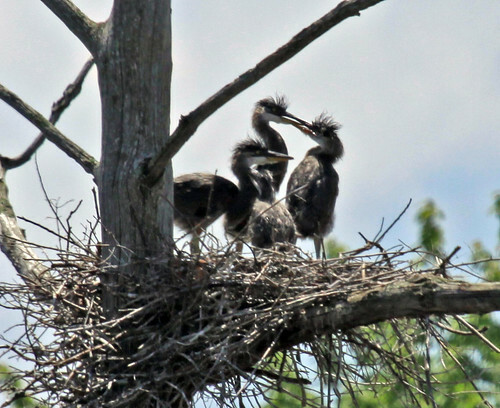 I thought about those baby herons. 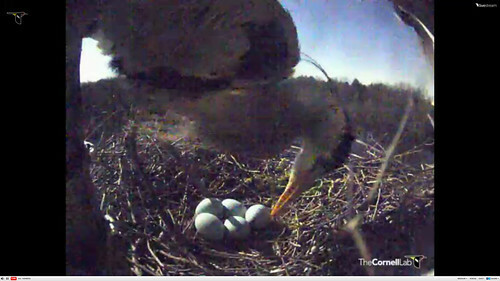 We got to see the moment each one made its first leap from the nest. It was such a long way down—would its wings support it? Might it crash into a branch and break a bone? Would it know to fly back when it needed food, and would it be able to return to such a high nest? What predators might be lurking? 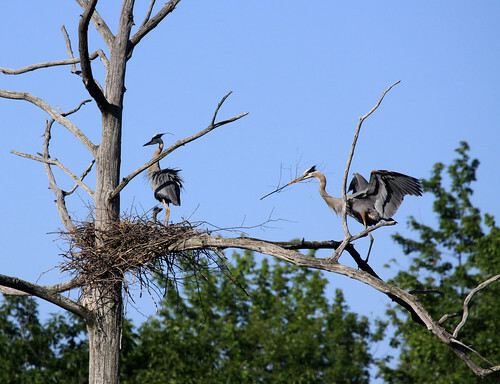 Dangers are everywhere, and those baby herons knew it. We'd all seen how they crouched when airplanes taking off or landing at the nearby Ithaca Airport passed right overhead. That was when they were tiny—after the first few times, they started tracking the planes with interest rather than fear, and then started ignoring them. We watched how all five of them, close to fledging, reacted when their father brought in one particular pile of fish. After the chicks had taken all the top fish, one of them started to grab the last one, a large goldfish. When it touched it, the fish started thrashing—it was still alive! The chicks had never seen food move before, and they all lurched up, staring with what looked to us like shock and surprise. When one of them tentatively touched it again, the fish thrashed again. The father picked it up and dropped it, as if reassuring his young that yes, this is food. Finally, very tentatively, the bravest of the bunch grabbed the fish and swallowed. 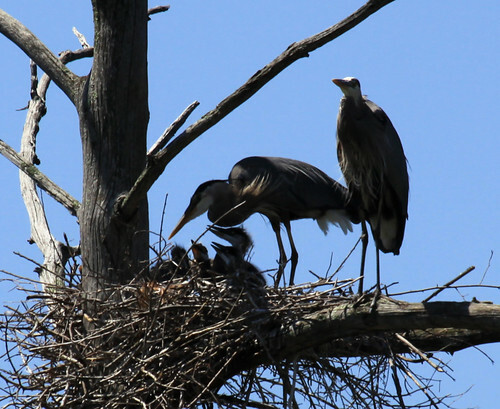 Yes, baby herons understand danger, and know fear. But there was a big, exciting world out there, just waiting to be explored. So when the time came, one by one, the little guys opened their wings, crouched low, and leaped. not only does this bring perspective to trials and pratfalls of life, it reminds me that this is the 5th anniversary of those 5 little bobbleheads being hatched in 2012. i imagine they are flying free and watching over their own hatchlings somewhere near the Lab. thanks for the memory, Laura. Thank you, Laura. For the memories, and for the lessons. 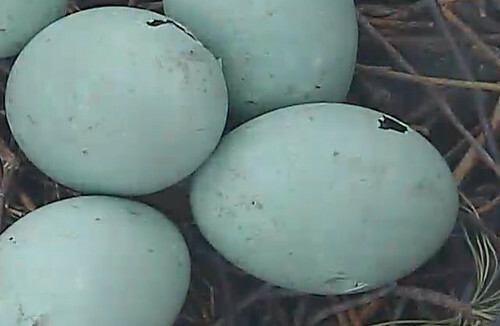 Five blue eggs. Who would have ever thought that would be the start of such an incredible experience? Thanks for the memories. I am glad you are doing well. It gives me hope for the future, for all of us. I envision five herons, flying free. I have to. Lovely -- the writing, the photos, the philosophy -- the birds and your heart! Thanks, Laura. We loved this post! Thank you for your writing. What you said is so true and reminds me of one of the most marvelous, exciting times in my life.